5 Reasons you NEED to go to Bolton’s Food & Drink Fest this weekend! What do you think when you hear the word ‘homeless’? You might associate homelessness with criminals, substance abuse and ‘scrounging’. But is this truly the reality? According to crisis.org.uk, there are 54,000 homeless people in the United Kingdom, so it can be very easy to forget that these are individual people with individual stories. Lauren (pictured above) is 17 and lives at Project Front Door. Her favourite past time is babysitting for her niece Kiana aged 2 (pictured). She is studying Health and Social Care at Rathbones College. She is aiming to be a youth worker or to work with children when she finishes the course. Beshaun is 24 and lives in Bolton. 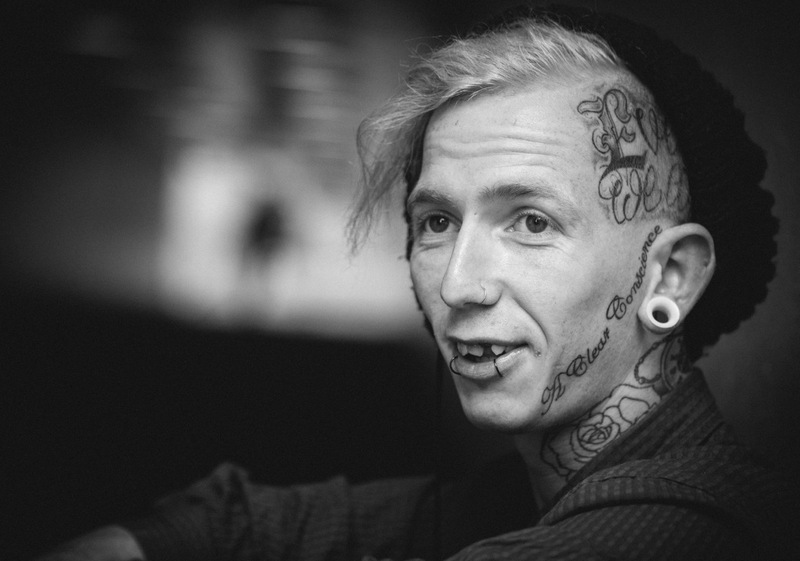 He enjoys tattooing and skate boarding. He is working as an apprentice at Studio 23 as a tattooist. In the above photo, he is photographed near St Peters way. This is one of his favourite places to come and watch the world go by! Bolton Young Persons Housing Scheme was set up in 1992 to offer accommodation and support to young people who are homeless. The Support Workers help young people to develop and learn the skills needed to live independently. This is a combination of practical and emotional support. Taylor is 17 and lives in Bolton at Project Front Door. She is studying Health & Social Care at Bury College. In her spare time she enjoys shopping with her friends and her favourite purchase would be any kind of makeup. Holly is 20 years old and lives in Bolton. She recently studied a degree at Cumbria University. Her qualification was in ‘Working with Children & Families’. She is currently studying an NVQ in Mental Health. In her spare time Holly loves horse-riding. She is seen above with Polly, her horse. In 2013, they came 3rd at the Queens Horse Show in London in the showing category. Love is not a smack in the face, or saying I will get no one better and you can’t be replaced. You and I could find ourselves homeless – after all, it’s as close as one pay day away. If you, or someone you know, finds themselves in a situation like this, BYPHS can help. Speak to them – you can find out more by clicking here.